On Monday, August 21, 2017, a solar eclipse will be visible across all of North America. (weather permitting). The whole continent will experience a partial eclipse lasting 2 to 3 hours. In fact, Hopkinsville, Kentucky has been identified as the “ideal location” to view this amazing event. It’s important to remember, that even though this event is amazing and very tempting to look at the Sun, that looking directly at the Sun is unsafe. 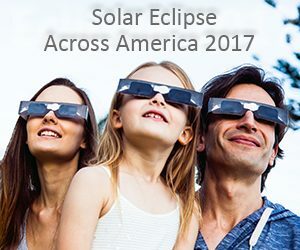 The only safe way to look directly at the uneclipsed or partially eclipsed Sun is through special-purpose solar filters, such as “eclipse glasses” or hand-held solar viewers. Homemade filters or ordinary sunglasses, even very dark ones, are not safe for looking at the Sun.